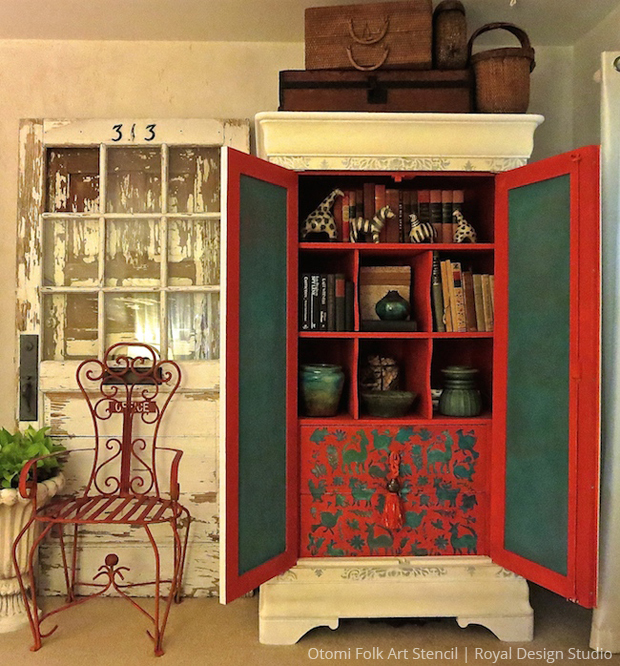 Home / How-To + DIY / How to: Chalk Paint® Decorative Paint / A Shabby Chic DIY Stenciled Cabinet with a Surprise! 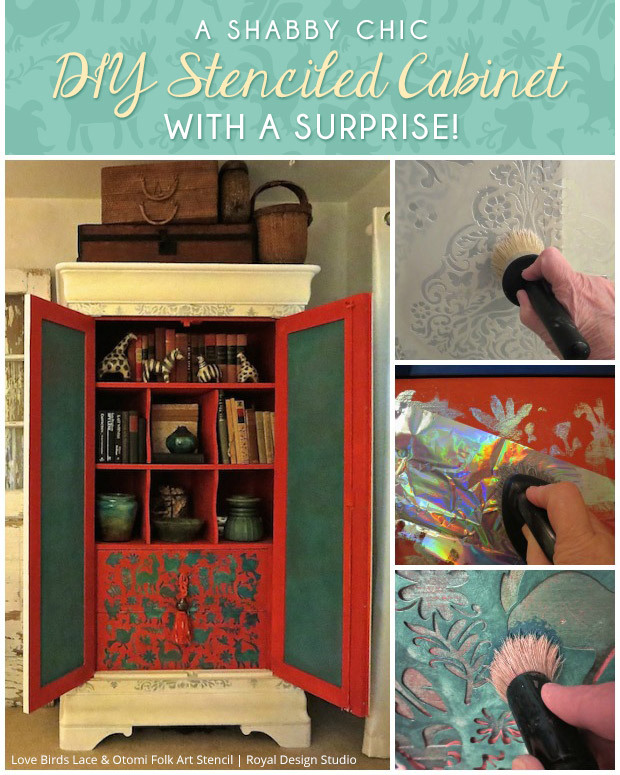 A Shabby Chic DIY Stenciled Cabinet with a Surprise! This cabinet has been painted twice and I can’t believe I was not happy with it both times. Has that ever happened to you? 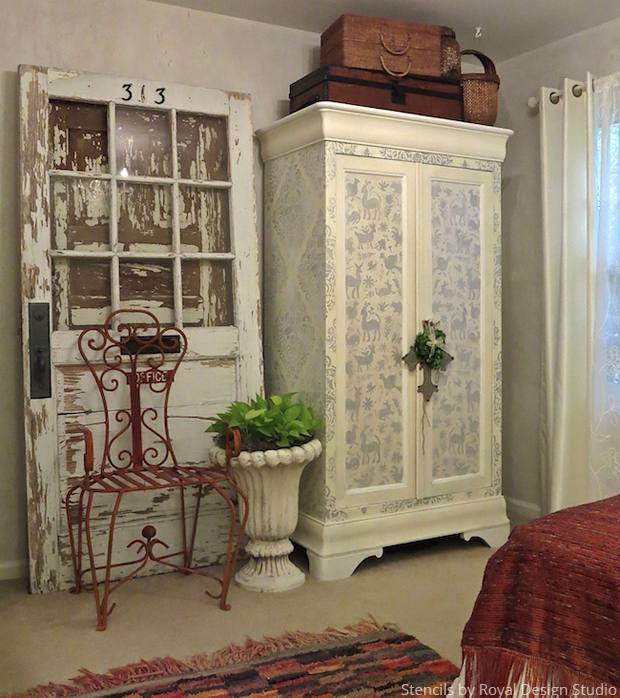 Finally, I painted it out in Old White Chalk Paint® by Annie Sloan and just let it be. For months. Just waiting for inspiration to strike. And strike it did. 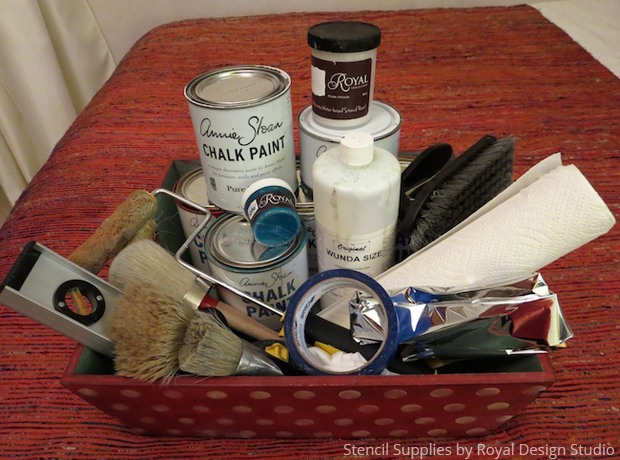 I laid eyes on these two new Royal Design Studio stencils and I was ready to create some magic! My concept was to get a neutral and soft look on the outside and Pow! on the inside. 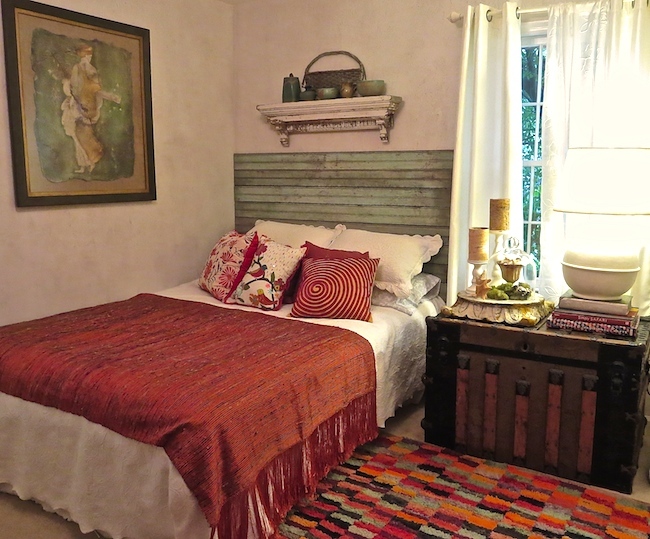 I wanted to coordinate with another stenciled piece in the same room and use colors inspired from the bedding, pillows and the Moroccan rug. This was a rather involved project that could be easily worked on over time. But I decided to take the plunge and complete it in one go. So, here it is! Royal Design Studio stencil brushes in assorted sizes, including the Super Large 3” stencil brush. STEP ONE: Paint the outside of your cabinet with two coats of Old White Chalk Paint®. 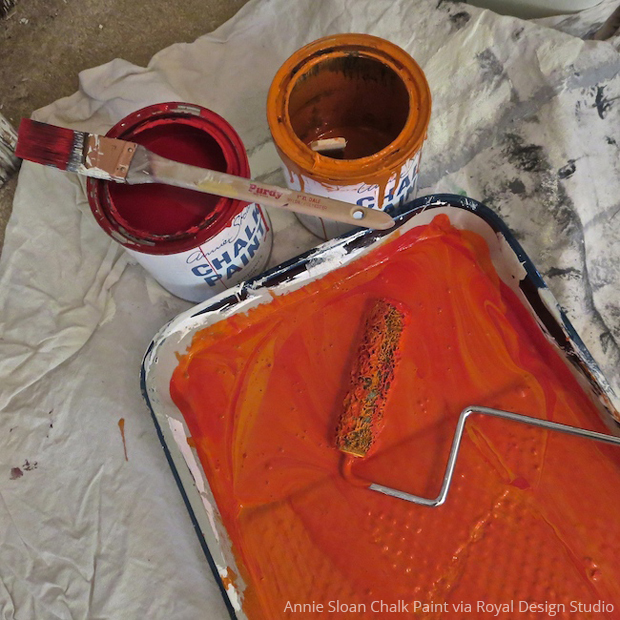 For the red interior, mix one-third Barcelona Orange with two-thirds Emperor Silk Chalk Paint®. Paint two coats and let dry overnight. STEP TWO: Find the center of the side panels and mark lightly with a pencil dot at the top. Align and tape the center of the Love Birds Lace damask stencil with the pencil mark and level it. 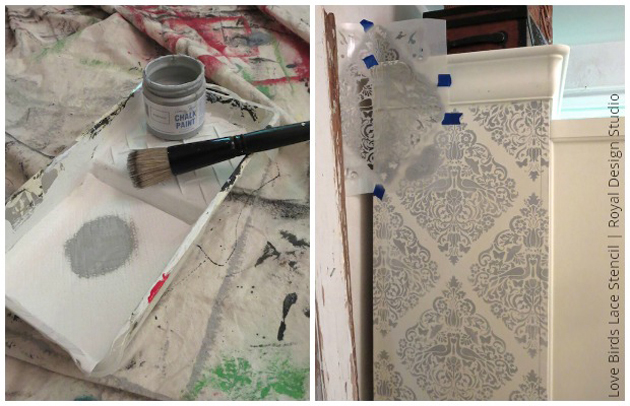 Using the Paris Grey Chalk Paint®, stencil the patterns on either side of the cabinet. 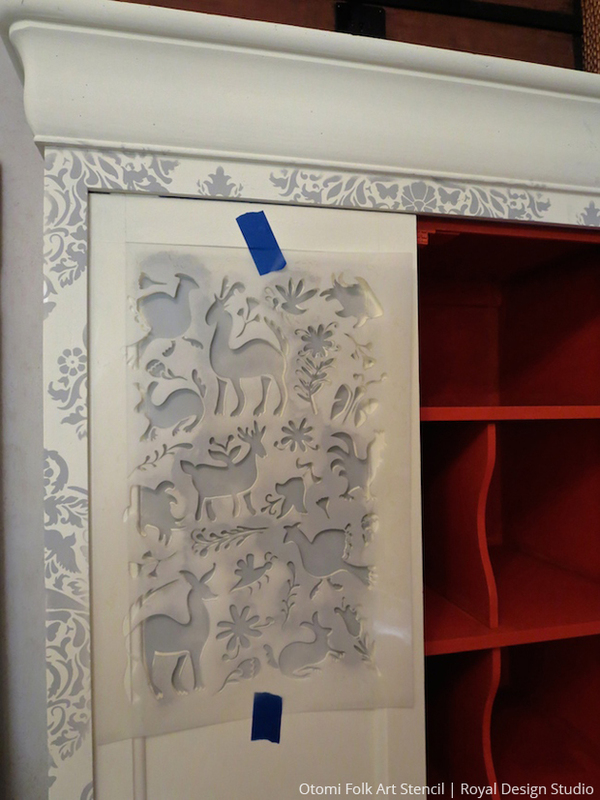 You can also stencil the front border of the cabinet as shown in the image above. 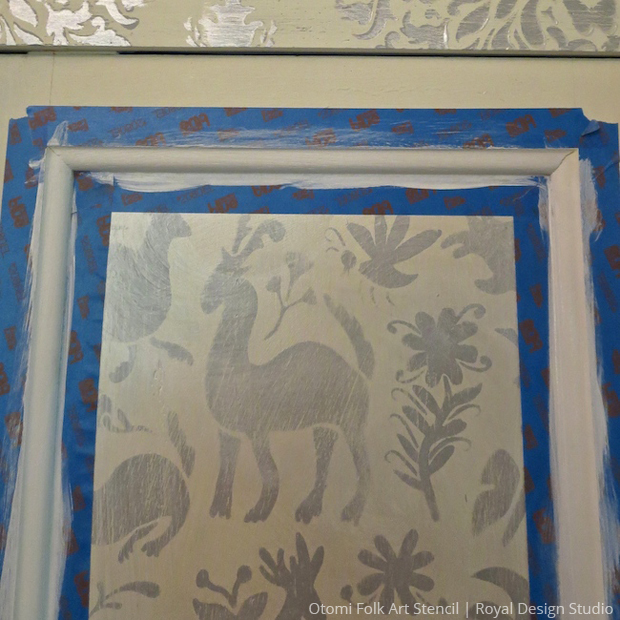 Next, position the Otomi stencil on the front panels and stencil with Paris Grey Chalk Paint®. STEP THREE: Sand the stencil patterns on all three sides of the cabinet lightly. Reposition the Love Birds Lace stencil on existing stenciled patterns and stencil a layer of the Pearl Oyster stencil creme using the super large stencil brush. This will help give a distressed look to the cabinet. For the front of the cabinet, brush the Pearl Oyster stencil creme all over the inside panels using the 3″ stencil brush. STEP FOUR: Tape off areas of trim and paint two coats of Pure White Chalk Paint. Touch up all messy areas as needed. STEP FIVE: Remove the drawer hardware. Find the center of the drawers and mark with a pencil dot. 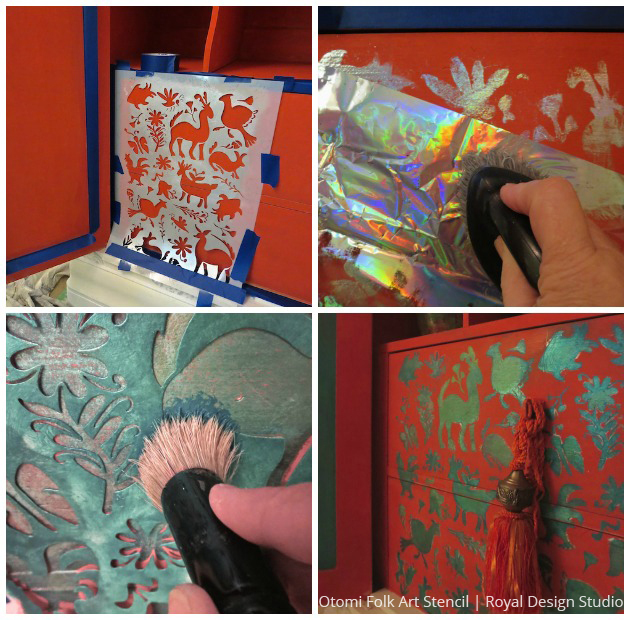 Tape the Otomi stencil and use a stencil brush to tap on Wunda Size. Let it come to tack for about 15 minutes. Remove the stencil and lay the foil down, bright silver side up, and rub with a stiff brush. Move the foil around as needed to cover all of the sticky size. 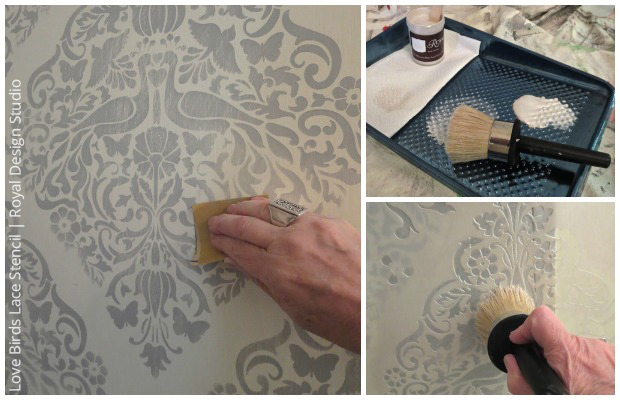 Place the stencil back in position and stencil with the Peacock Fancy stencil crème. I am never too worried about perfection, a little hand-painted look always looks great! STEP SIX: Use a clean rag and wipe on one thin coat of Annie Sloan Soft Wax on the entire piece. Wipe off any excess with a different rag, turning to a clean area often. Buff to a soft sheen. What do you think? I know I got a bit wild on the inside, but I love it! If you are working on some fun stencil projects of your own, we would love to see some pictures. You can share them on the Royal Design Studio’s Facebook Page or hashtag them with #royaldesignstudio on Instagram. Oh woowwww … stunning colors together! I really like the idea of the surprise color on the inside and can see how it must really add to the global flea chic in this room! I love the giraffes you have displayed. I’m afraid that I’d never do what you did, but it is beautiful! Thank you Elic, I found those raku giraffes years ago. I spent a few weeks in East Africa and they bring back fond memories. And you sure can do what I did, or try a simpler version. Love to see what you do! I don’t even know how I ended up here, however I believed this submit was once good. I do not recognize who you’re but definitely you are going to a famous blogger for those who aren’t already. Its such as you read my thoughts! You appear to understand a lot about this, such as you wrote the guide in it or something.I feel that you could do with a few to power the message house a little bit, however other than that,this is excellent blog. An excellent read. I’ll certainly be back. Pingback: Stenciled Drawers are Great Painted Furniture Ideas!